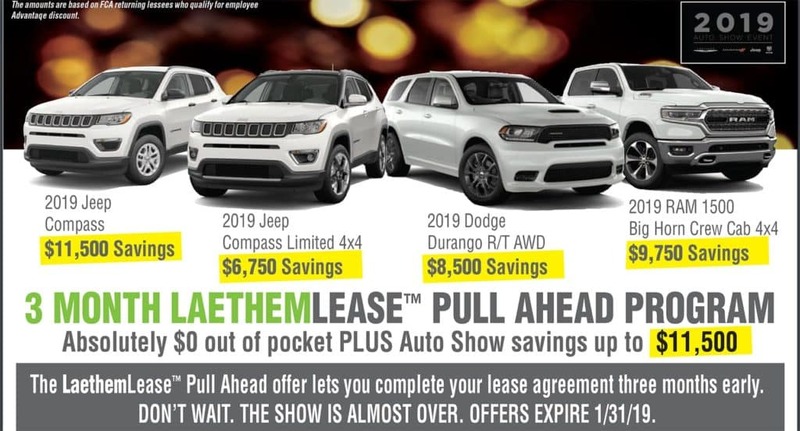 Ray Laethem Announces 3 Month Lease Pull-Ahead Offer | Ray Laethem Chrysler Dodge Jeep Ram " "
LaethemLease™– Absolutely $0 Due At Lease Signing. ALL TAXES AND FEES INCLUDED! No rollover. No money out of pocket. No worries! 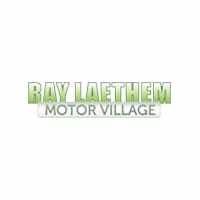 Ray Laethem Is Waiving Up To 3 Months Of Your Current CDJR Lease. DON’T WAIT. THE SHOW IS ALMOST OVER. OFFERS EXPIRE 1/31/19. Up To $11,500 In Auto Show Rebates PLUS Truly $0 Due At Lease Signing Makes Now The Best Time To Lease. We are authorized to satisfy the final three full-months lease payments on your current vehicle, regardless of the amount of those payments. There are no exceptions. You have been chosen to receive this non-transferable lease pull-ahead offer. In order to qualify, your current leased vehicle must be returned and new lease signed by 1/31/2019. Everything Is Included… ALL Taxes, ALL Fees, Even Your First Month Payment. | 10k 12k and 15k miles all shown. • 4 x4 • Heated Leather Power Seats & Steering Wheel • Rear Camera • Power Liftgate • Uconnect 8.4″ Color Touch Screen • Apple CarPlay & Android Auto • Satellite Radio w/1 Year Subscription • Dual-Zone Auto Temperature Control • 19″ Polished Black Pocket Aluminum Wheels & Much More! Stk. #KT641880 *LaethemLease™payments include all taxes, 1st month payment, title, license plate transfer, CVR document, destination and acquisition fees. New license plate additional if needed. Payment is based on Top Tier credit approval. Must qualify for security deposit waiver. Pricing for Michigan residents only. Picture may not represent actual vehicle. Must take delivery by 1/31/19. • 4×4 • Heated Leather Seats & Steering Wheel • Wiper De-Icer • Power Liftgate • Auto-Dimming Mirror • Remote Start • Security Alarm • Rear Camera & Park Assist w/Stop • Blind-Spot & Cross-Path Detection • Uconnect 8.4″ Color Touch Screen • Apple CarPlay & Android Auto • Power Seat • 18″ Polished/Painted Aluminum Wheels & Much More! Stk. #KD367888 *LaethemLease™payments include all taxes, 1st month payment, title, license plate transfer, CVR document, destination and acquisition fees. New license plate additional if needed. Payment is based on Top Tier credit approval. Must qualify for security deposit waiver. Pricing for Michigan residents only. Picture may not represent actual vehicle. Must take delivery by 1/31/19. • V6 Crew Cab 4×4 • Bucket Seats • Class IV Receiver Hitch • 20″ Chrome Clad Wheels • Remote Start • Level 1 Equipment Group • 8.4″ Color Touch Screen • Apple CarPlay & Android Auto • Power Adjustable Pedals • Power Sliding Rear Window & Folding Mirrors • CD Player • Satellite Radio w/1 Year Subscription • Rear Defroster • Rear Camera & Much More! Stk. #KN728100 *LaethemLease™payments include all taxes, 1st month payment, title, license plate transfer, CVR document, destination and acquisition fees. New license plate additional if needed. Payment is based on Top Tier credit approval. Must qualify for security deposit waiver. Pricing for Michigan residents only. Picture may not represent actual vehicle. Must take delivery by 1/31/19. • Limited • Leather Heated & Ventilated Front Seats • Heated 2nd Row Seats • Power Front Seats • Remote Start • Rear Camera • Rear Park Assist w/Stop • Blind Spot Monitoring & Rear Cross-Path Detection • Tri Pane Panoramic Sunroof • Stow & Go Seats • 3-Zone Auto Temperature Control • Power Liftgate • Power Sliding Doors • Stow ‘n Vac Integrated Vacuum & Much More! Stk. #KR507792 *LaethemLease™payments include all taxes, 1st month payment, title, license plate transfer, CVR document, destination and acquisition fees. New license plate additional if needed. Payment is based on Top Tier credit approval. Must qualify for security deposit waiver. Pricing for Michigan residents only. Picture may not represent actual vehicle. Must take delivery by 1/31/19. The LAETHMLEASE is designed to make leasing easy. So, with a LAETHEMLEASE the price you see is the price you pay. Everything is included…all taxes, all fees, even your first month’s payment. And, with a LAETHEMLEASE, absolutely zero is due at signing. Check out the facts. Invest two minutes to watch a short video. It will be time well spent. 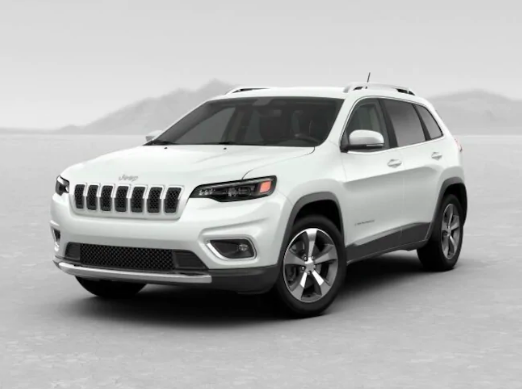 View All Jeep LaethemLease Options Here! 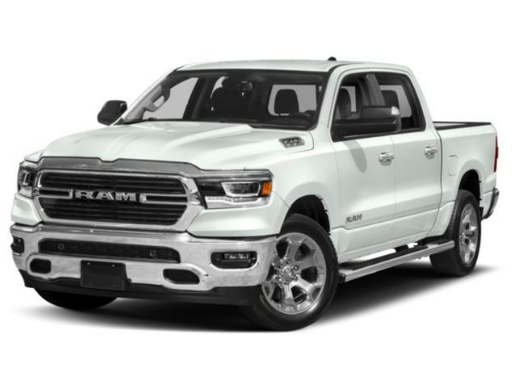 View All RAM LaethemLease Options Here! 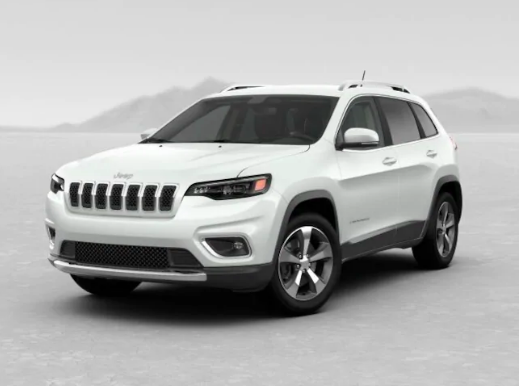 View All Dodge LaethemLease Options Here! 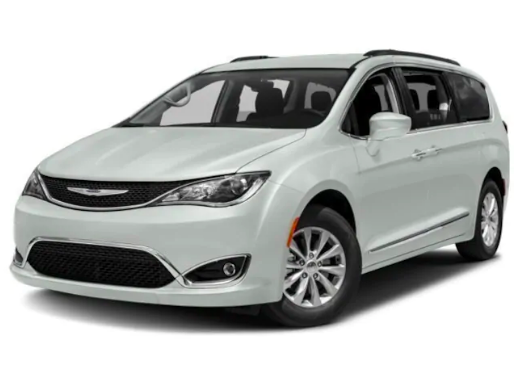 View All Chrysler LaethemLease Options Here!